During the eye-opening development phase in mice, in primary visual cortex, changes in GABAA postsynaptic receptor function appear to occur in a highly regulated manner. In particular, significant correlation [1, 2] exists between the developmental reduction in the duration of inhibitory postsynaptic currents (IPSCs) and the concomitant developmental changes in total inhibitory synaptic weight (Figure 1). Using a computational model , we characterize the extent to which GABAA receptor plasticity and changes in synaptic weight affect the input-output transfer of a neocortical microcircuit consisting of pyramidal cells with reciprocal synaptic connections to perisomatic innervating interneurons. We found that when developmental GABAA receptor plasticity is matched by a gradual shift in overall inhibitory synaptic weight, input-output constancy is created with respect to both firing frequency (Figure 2) and spike train patterning. We propose that GABAA receptor plasticity matches the concomitant shift in synaptic weight per neuron in order to guarantee homeostasis of microcircuit function. We discuss the putative relevance of such a regulatory mechanism in terms of neocortical development. In addition to demonstrating homeostasis of neuronal activity during maturation of the GABAergic synaptic network, we show that IPSC decay affect burst firing, that accelerating the IPSC decay appears to reduce the extent of flicker fusion, and that changing the IPSC decay provides the microcircuit with a synaptic mechanism for gain modulation. Changes in GABAergic neurotransmission during neonatal development. Relationship between sIPSC frequencies and decay time constants during postnatal development of the rat visual cortex. Shown are the average values for each neuron measured. 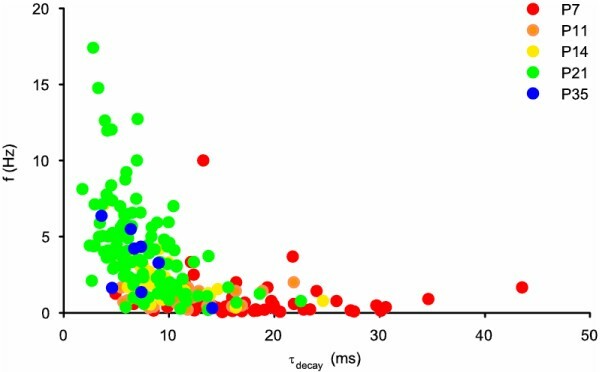 Homeostasis of firing frequency during neonatal development. For different input frequencies, the output frequency of the microcircuit is shown as a function of both inhibitory synaptic weight and IPSC decay time.